From the Cisitalia of 1947 (bottom, an example on show at this year's Automotoretro in Turin) to the 2uettottanta concept of 2010 (top), through the Flaminia Presidenziale. These are some of the milestones of Pininfarina design now on show in the refurbished Museo Nazionale dell’Automobile di Torino, which has just reopened. From the Cisitalia of 1947 to the 2uettottanta concept of 2010, through the Flaminia Presidenziale. These are some of the milestones of Pininfarina design now on show in the refurbished Museo Nazionale dell’Automobile di Torino, which has just reopened. Among the 200 cars on display in the reborn museum dedicated to the history of cars with four wheels the Cisitalia 202 could not be missing. So the "moving sculpture", as defined by Arthur Drexler, can be admired again by the public, after an accurate restoration completed in 2009 at the Pininfarina plant in Cambiano (Turin). The car is still on display at MoMA in New York, where the Cisitalia was described as "one of the eight most beautiful cars of our time". Built on a tubular chassis and built in small series (approximately 170 units, including convertibles) with aluminium body welded to a skeleton of steel, its formal approach marked a turning point of automotive style and consecrated the founder Pinin Farina overseas. The same set-designer François Confino, author of the new layout of the Museo Nazionale dell’Automobile di Torino, recently said: "The most beautiful car in the Museum? The Cisitalia. If I had to steal one, I'd steal that." Among the cars that have marked the history of Pininfarina design, the museum houses the Flaminia Presidenziale, one of the four units made for the President of the Italian Republic and still used today in the big national parades. This car was designed and built by Pinin Farina in 1960 at the request of the President of the Italian Republic Giovanni Gronchi. The car on show in the Museo Nazionale dell’Automobile di Torino made its official debut in 1961, during the visit of Queen Elizabeth. 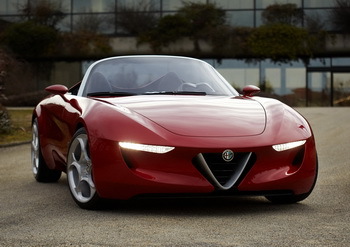 The Pininfarina design of today is represented by the latest concept car, the 2uettottanta, with whom Pininfarina has celebrated in 2010 its 80 years of activity, paying, at the same time, tribute to Alfa Romeo, which in 2010 celebrated 100 years of life. 2uettottanta has just won at the Geneva Motor Show the Car Design of the Year Award for the best car design of 2010 in the concept car category. Also in Geneva, the Pininfarina design team was honored by the Czech magazine Autodesign&Styling with the AutoDesign Award. "We are grateful to the Museum for giving space to our creations of the past and present," Chairman Paolo Pininfarina says, "giving due recognition to the Pininfarina design, which has crossed the ages while maintaining a level of excellence. The new structure, so carefully prepared in order to create a fascinating, dynamic and interactive journey through the cars and the events that have marked the history of the automobile, is an important sign of vitality for Turin, the undisputed capital of the car, and we believe it will become a new pole of attraction of the city's cultural life." In a special area designed primarily for students who aspire to pursue a career in automotive design, museum visitors can listen to interviews with Paolo Pininfarina and other famous car designers and learn about their training and professional aspects, their sources of inspiration, the origin of their vocation to design, their most celebrated projects and even those which were not so popular on the market as hoped, the cars which they would have liked to create and the projects they were more keen on, their masters and their disciples, and especially a message for the future and the issues that the designers of tomorrow will face.